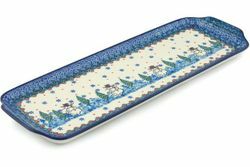 Polish Pottery Platter is a great addition to your table. This long and narrow stoneware platter is one of those timeless pieces you'll want around for both everyday use and entertaining. All our platters are handmade and hand painted. This stoneware platter is hand crafted at famous Ceramika Artystyczna factory, Poland. Strength, durability and beauty in each piece make polish pottery dinnerware a beautiful presentation and a very practical gift.